Earlier this year I started gaining a hectic interest in the rap collective from Joburg, REVIVOLUTION! Along with this interest came a particular one in member Illy Amin. Not conforming to the route that many underground J-Sec rappers are taking in terms of swinging to a slightly conscious audience, Illy Amin uses his great sense of humor and honesty to deliver lyricism at its best. Straight Outta Grimetown is easily in my top ten mixtapes released this year mainly because of its relevance to me and other rap fans. 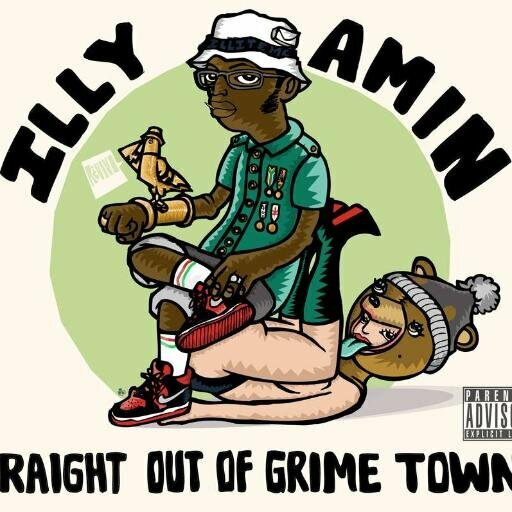 Straight Outta Grimetown is one of those mixtapes that you hear people talk about but only once you’ve heard it for yourself are you able to really understand what’s so special about not just the project but the artist behind it too. Illy easily delivered some of the best verses I’ve heard this entire year, on tracks such as ‘Trolling’ which is 2 minutes and 51 seconds of hard punchlines, and on ‘Ric Flair’ and ‘Pimp Pimp Hooray’ where he raps about taking over globally and “speaking Tswana to a French chick in expensive shoes”. With features from Youngsta CPT and his Revivolution peers including Impropoe and Tony Dangler that he later sends special shout outs to on ‘One Bless’, Illy Amin almost immaculately captured what it’s like living in the “City of Grime”, and takes you through the experience of rapping in some of the illest ciphers, spitting about his love for women and money as well as avoiding crime and the grind and effort needed to take a dream that you have and make it a reality all in under 45 minutes. The mixtape caters to both the heavy lyricism seeking fans as well as the hip hop headz looking for a good beat. Straight Outta Grimetown has an overall very laid back vibe to it that makes it easy to listen to any time; A really dope mixtape that birthed new fans and rap appreciators not just in the city of gold but nationwide!